Why Have Bond Markets Been So Volatile? Interest rates have risen significantly in 2013 with the five-year Treasury rate up 0.67 percent through the end of the second quarter. To put this increase in perspective, from the end of 1962 through 2012, there were 17 other years when interest rates increased this much or more over an entire year. The recent increase in interest rates has led to questions about why they have risen so substantially and what the implications are. The U.S.’s central bank, the Federal Reserve, continues to be the dominant influence on interest rates, and it has aggressively acted to keep them down since 2008–2009. The Federal Reserve has done so by keeping the federal funds rate low and purchasing enormous quantities of bonds. The thinking was that lower interest rates would help improve the economy and bring down unemployment. While no one would say the economy is back to full health, the Federal Reserve has indicated it believes it will be healthy enough in the near future to begin slowing down portions of its policy efforts. On June 19, Chairman Ben Bernanke indicated that he expects the Federal Reserve will begin to reduce the amount of bond purchases later this year and end them by next year. This is generally believed to be the reason interest rates increased during the second quarter. It is important to keep in mind that the Federal Reserve still expects to keep the federal funds rate (which is the primary way it influences interest rates) low for some time to come. While no one knows whether interest rates will move higher or fall again, the recent increases are actually good news for bond investors with long time horizons and relatively short- and intermediate-term bond holdings. Although the value of those types of holdings has generally gone down in 2013, the long-term returns investors can now expect from bonds are higher than they were at the start of the year. Regardless of which direction interest rates move, investors are better served when they keep an emphasis on short- and intermediate-term bonds and bond funds with high credit quality in the fixed income portion of their portfolio. When the city of Detroit filed for Chapter 9 bankruptcy on July 18, the municipal bond market and ratings agencies were well aware of its troubles. Its general obligation bonds had been rated below investment grade since January 2009. They had been trading at very high yields relative to high-quality municipals over the past few years, which is a clear sign of financial stress. Some have wondered whether Detroit’s bankruptcy has broader implications for the municipal market and whether it is a harbinger of further defaults. At this point, Detroit’s default and other defaults have been due to special circumstances and sporadic in nature. Predictions of a wave of defaults (on rated bonds at least) can be considered extreme, particularly given the pricing of Aa-rated and Aaa-rated municipal bonds in the marketplace, which is hardly suggestive of high default risk. While there is no way to eliminate all exposure to municipal market credit risk, keys to mitigating this risk include broad geographical and issuer diversification, focusing purchases in the general obligation and essential services sectors, and high underlying credit ratings. Following these criteria would mean that positions like those of the city of Detroit generally would not be purchased. Over the past 50 years, academic research has identified variables that appear to explain differences in average returns among stocks. The variables (or premiums) that have stood up to rigorous testing are considered dimensions of expected returns. During the 1960s, William Sharpe and others conducted asset pricing research that led to the development of the capital asset pricing model (CAPM), which proposed the market as a dimension of expected return. Known also as the single-factor model, CAPM reinforced the value of diversification and provided a simple, rational approach to measuring investment risk and expected returns relative to the market. Advancing research during the 1970s identified additional factors in stock performance. In 1981, Rolf Banz observed that small company stocks tended to have higher returns than large company stocks, as measured by their market capitalization. The size effect provided a more detailed framework for understanding the dimensions of equity performance. In a highly influential paper published in 1992, Eugene Fama and Kenneth French synthesized much of the previous research on asset pricing and found that stocks with low relative prices (or high book-to-market ratios) offered higher average returns than companies with high relative prices (low book-to-market ratios). They concluded that company size (small vs. large) and relative price (value vs. growth) were strong determinants of stock performance and, when combined with the market, explained most of the average differences among stock returns. More recently, Fama, French and other academics have identified expected profitability as a dimension of expected returns. When controlling for size and relative price, research shows that more profitable firms have higher expected returns than less profitable firms. In summary, financial science continues to provide a refined, clarifying view of the global equity markets. Advancements in academic research also have practical implications. The discovery of the size and value premiums led to the creation of low-cost mutual funds designed to capture these premiums. These funds have improved the range of allocation options that investment advisors and their clients can choose from. 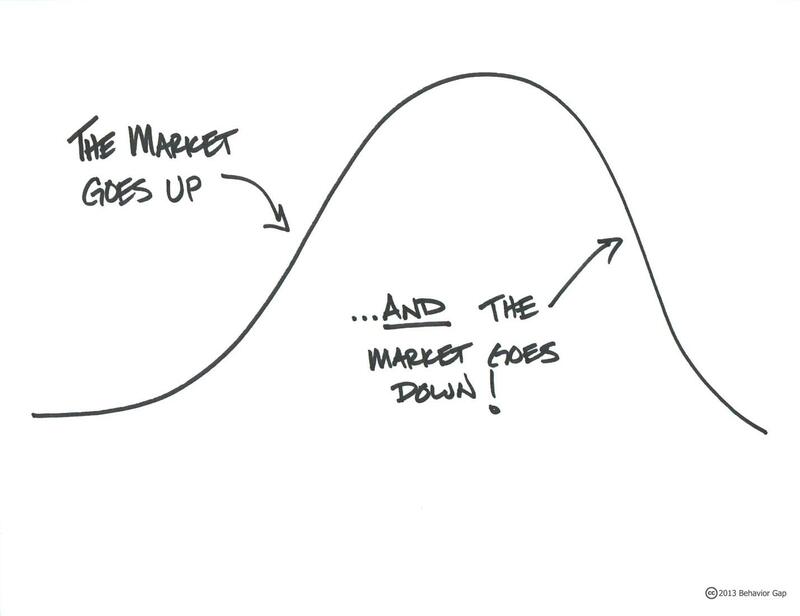 This sketch from Carl Richards, author of The Behavior Gap (2012) and director of investor education for the BAM ALLIANCE, puts market movements in perspective. Sometimes we forget that the market goes up AND down. That’s why we put emotional guardrails (a financial plan) in place to keep us from overreacting when fear attempts to make us pull over or when greed tries to convince us to take a detour. Both extremes can be avoided, but it requires keeping focus on our financial plan, which is based on our goals.